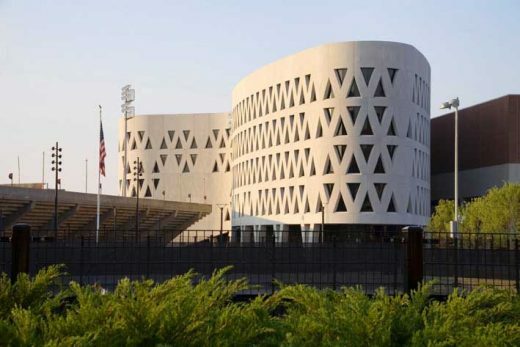 The Athletic Center at the University of Cincinnati can be described as both a freestanding infill, and as a contextual free-form. Its unusual boomerang-or link pin-exterior shape has been designed to maximize its tight site constraints, which results in dynamic residual spaces between its curvilinear shape, the existing stadium and Shoemaker Arena, as well as sports fields and the University Recreation Center. It also offers a spectacular view to and from the stadium. The five-story atrium links the north and south street entrances and acts as a common space for all the Athletic center’s functions from the athletic offices on the top floor to training rooms below ground. While the Athletic Center will be principally used by athletes, the new auditorium, classrooms, the UC Club, and the playing fields will be shared by students and faculty from the greater university.